Websites are quickly becoming one of the most popular ways of advertising. Whether it be a business, its product or service or something completely different, everyone of all ages is turning to the web as a method of getting their message out there. With the popularity of this marketing medium increasing and the number of websites always growing, it is obvious that everyone wants to appear at the top of Google's search engine rankings. Achieving such a task is not an easy feat, however with a bit of perseverance, one can definitely improve their chances of reaching that glorious first page result. Given that there is a heap of websites out there who are on the first page, what is their secret? It is a little industry term called "SEO" and it stands for Search Engine Optimization. SEO basically consists of the customization of your website, its content and its internal and external links to assist in the overall indexing and ranking of your website in popular search engines. There are many contributing factors that are used in determining a website's ranking and every search engine is different. This makes trying to optimize your site for Google, Yahoo, Live and the many others quite a painstaking task. 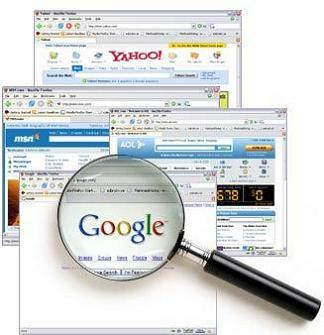 As most of us are aware, Google is currently the most popular search engine for the majority of Internet users. As such, it is only normal that we'd want to focus our sights on achieving a higher ranking within Google first with the hope that the rest will follow. To do this, we must start a journey that could potentially take months before we start seeing any real change, however we have to start somewhere. Our journey begins by defining some of the key contributing factors that Google uses to determine a website's and webpage's ranking within its results. These factors range from keyword use to manipulating internal and external links and the líst goes on. To get you started, we have listed the top twenty factors that you should focus on in order to help get your website that little bit closer to the top of the search engine results listings. The following components relate to the use of search query terms in determining the rank of a particular page. 5. Keyword Use in Domain Name & Page URL - Including the targeted term/phrase in the registered domain name, i.e. keyword.com plus target terms in the webpage URL, i.e. seomoz.org/keyword-phrase. The following elements comprise how Google interprets specific data about a webpage independent of keywords. 6. Link Popularity within the Site's Internal Link Structure - Refers to the number and importance of internal links pointing to the target page. 8. Age of Document - Older pages may be perceived as more authoritative while newer pages may be more temporarily relevant. 9. Amount of Indexable Text Content - Refers to the literal quantity of visible HTML text on a page. 11. Global Link Popularity of Site - The overall link weight/authority as measured by links from any and all sites across the web (both link quality and quantity). 12. Age of Site - Not the date of original registration of the domain, but rather the launch of indexable content seen by the search engines (note that this can change if a domain switches ownership). 13. Topical Relevance of Inbound Links to Site - The subject-specific relationship between the sites/pages linking to the target page and the target keyword. 14. Link Popularity of Site in Topical Community - The link weight/authority of the target website amongst its topical peers in the online world. There are also some points we should make before you start getting your hands dirty. With any type of SEO marketing, there are some things that can actually have a negative impact on your ranking. These following components may negatively affect a spider's ability to crawl a page or its rankings at Google.  Server is Often Inaccessible to Bots.  Content Very Similar or Duplicate of Existing Content in the Index.  External Links to Low Quality/Spam Sites.  Duplicate Title/Meta Tags on Many Pages.  Overuse of Targeted Keywords (Stuffing/Spamming). It's now time to get busy! Start prioritizing your tasks, modifying your content and building your internal and external links to meet some of the above guidelines. Keep in mind that improving indexing is mostly a technical task and improving ranking is mostly a business/marketing strategy. What might work now may not work in the future and finally, it takes time. Loads of time. Still, with a bit of trial and error and a good dose of persistence, you can achieve the search engine ranking you're after. Jon Bergan is the owner of Bergan Blue, an Australian based creative design firm focused on bridging the gap between the online world of the Internet with the offline world of Marketing.